In a time lost to history, the first Lethid War sundered the Earth and sank mighty Atlantis, the heart of the Sli'ess Empire. The cruel reptilian sli'ess were scattered, their interplanar network destroyed, and their technology lost. Mankind has forgotten the scourge of the Slavelords, and time has moved on. Now, thousands of years later, tentacled shapes once again cast their shadow across the stars. The lethid are returning, eager to exact revenge on the Sli'ess Empire. Will Earth be caught once again between cosmic evil forces - or are there yet brave heroes to answer the call? 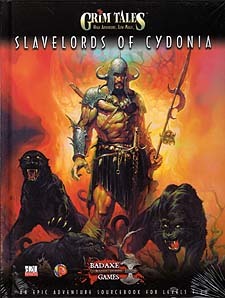 Slavelords of Cydonia is a d20 adventure sourcebook designed for experienced GMs and players. The first half of this book details an epic adventure for characters of 1st through 20th level. Set in a time and place of the GM's choosing, each adventure includes the hooks needed to set up the action and the seeds you can use to move the story forward. You can play the adventures in any order, choosing from the dozens of included adventures as your players are given free reign to explore Cydonia. The second half of this book contains rules and resource material to develop a complete Cydonian setting. The reptilian sli'ess, their society, religion, magic and technology; the tentacled lethid and their insidious psionic powers, a bestiary of Cydonian creatures; and a complete mass combat system you can use to play out the major battles in this (or any) campaign. Slavelords of Cydonia is designed for use with the Grim Tales rulebook, but includes conversin notes for other d20 rule systems. Requires the use of a d20 Rolplaying Game Core Book.